Today the banana industry is being threatened by a fungus known as Tropical Race Four. This infection has resisted every counter-measure and may eventually doom modern bananas altogether. Seemingly out of nowhere, the latest crisis has hit the Australian Pistachio nut industry. In December 2010 torrential rainfalls created ideal conditions for an outbreak of the moisture-loving anthracnose fungus. Australia’s pistachios originate almost entirely from a single cultivar developed in the early 1980s. Until recently, anthracnose was thought to be a mango-specific pathogen. This latest outbreak has devastated the Australian Pistachio crop resulting in a harvest reduced by more than 50 percent. Less than half of the harvested nuts were edible. These issues point to a broader problem. Many agronomists say the clock is ticking on fossil-fuel pesticides and fertilizers. They point to widespread soil wearying techniques and to modern agriculture’s risky reliance on vast monocultures. Entomologists Ted Schultz and Sen Brady at the Smithsonian National Museum of Natural History published research in 2007 that establishes that the fungus-growing ants are all descended from a common ancestor. During a period of global warming this humble ant pioneered agriculture some 50 million years ago. One group of fungus-growing ant cultivated their fungi to produce specialized fruits that the ant harvests and eats for food. 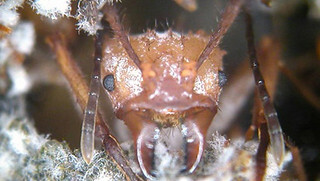 The leaf-cutter ant belongs to this group. The leaf-cutter ant tends underground soil chambers or gardens. Here their crops are routinely exposed to a number of micro-fungal pathogens which attack the crop-fungus. A research team led by bacteriologist Cameron Currie, of University of Wisconsin-Madison, has documented a previously unknown symbiosis between the leaf-cutter ant and bacteria. Professor Currie’s team discovered that some worker ants have a special white wax-like substance over their bodies. This substance is a bacterium of the group actinobacteria. Over 80% of the antibiotics used by humans come from this group. The remarkable conclusion is that this ant is using antibiotics to treat it’s crops. 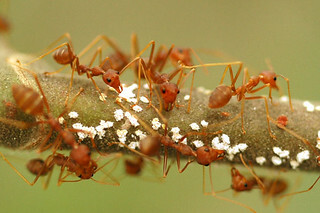 In addition to the use of disease-killing bacteria, the ant employs sophisticated farming techniques. It cultivates it’s fungal monocultures by constantly transplanting the best parts of the gardens to control disease. The humble ant’s methods may point the way forward for human farmers. I appreciate the verse from Proverbs at the end.